In my previous blog post, I had explained how ITeLo (an imaginary company) wanted to extend the SuccessFactors new hire Onboarding process to suit their business requirement. To achieve that, SAP Cloud Platform Business Rule, Workflow & Integration flows were created. 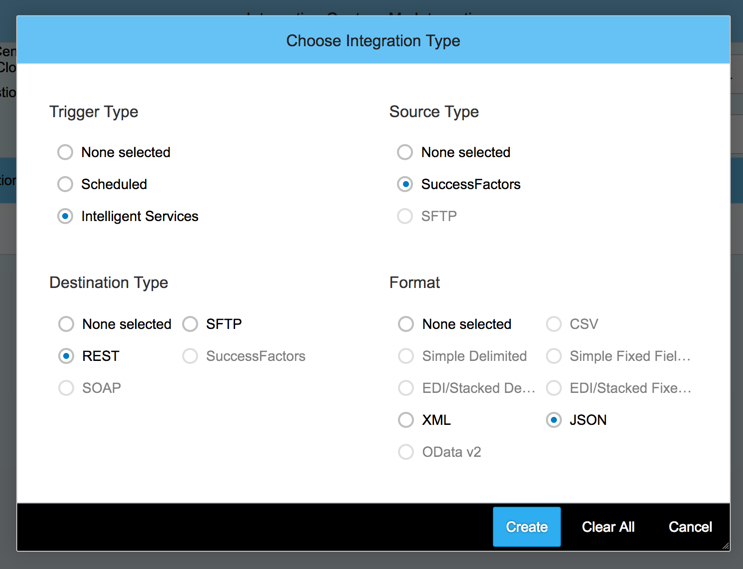 In this blog, I will explain how to trigger the SAP Cloud Platform Integration flow from SuccessFactors whenever a new hire is recruited, so that the Onboarding extension process is initiated. In the next screen, the particular event in Intelligent Services is chosen. For ITeLo’s use case, the required event is ‘Employee Hire’. Based on the event, the OData entity is automatically determined. In the case of Employee Hire event, the OData entity available by default is Job Information (EmpJob). Depending on the context information needed for the extension process, you need to make additional information available in the integration. For example, ITeLo requires a different process for different countries. Hence the employment country of the new hire needs to be available. ITeLo also requires to automatically determine equipment based on certain business conditions role, department, etc. and hence this information also needs to be made available in the event context before connecting to the endpoint. Hence the entities EmpJob, PerPersonal & User are made available as mapped fields in any output structure you would want (in ITeLo’s case all these entities are collected under a node called empData in the output). For more information on how to choose the starting OData entity for outbound integration refer to this help document. ITeLo doesn’t want to extend the standard Onboarding process for the operations in Israel since the total headcount is less than 10 employees. So, they have applied a filter in the integration model so that if the extension process is initiated for all hiring countries other than Israel. Finally, in the destination settings, the endpoint for connecting to the SAP Cloud Platform Integration Flow is maintained. Note that the HTTP method is of type POST (since there is a need to pass the context payload in the body of the message) and the payload format is JSON. Note: The Integration center has been configured to pass the context to theSAP Cloud Platform Integration flow. So, based on the format that you choose in the Integration Center(XML/JSON) the handling of the context will be different in the integration flow. 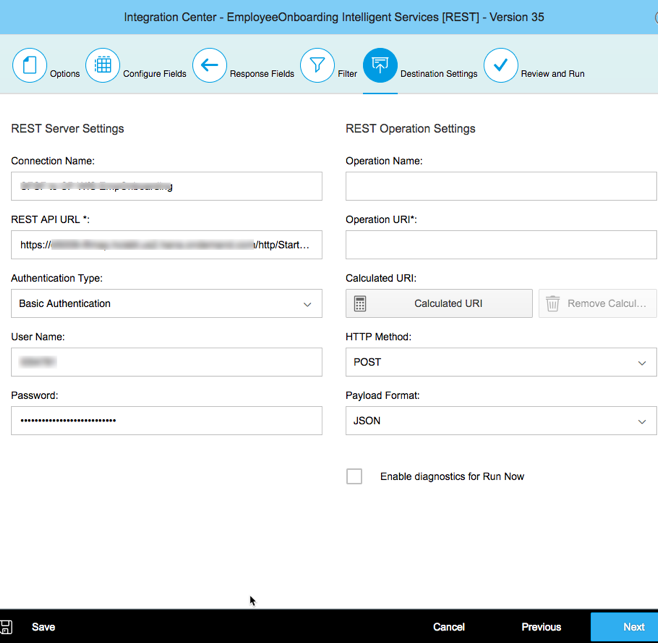 With this setup whenever a new employee is hired, the integration center immediately picks up the business event (the trigger type was Intelligent Services) and call the integration flow in SAP Cloud Platform Integration along with the details of the new hire. The Integration Flow will create a workflow instance based on the country of new hire and also pass the details of the new hire to SAP CP Workflow. As per the workflow definition (for example, when the country of a new hire is the USA), the buddy will get a task in SAP Cloud Platform’s My Inbox application, where he/she can add/remove equipment which is proposed by the Business Rule. Note that the user interface shown in the task details page (which contains Personal Information, Job Information & Equipment table) is custom developed based on the information available in the help document. 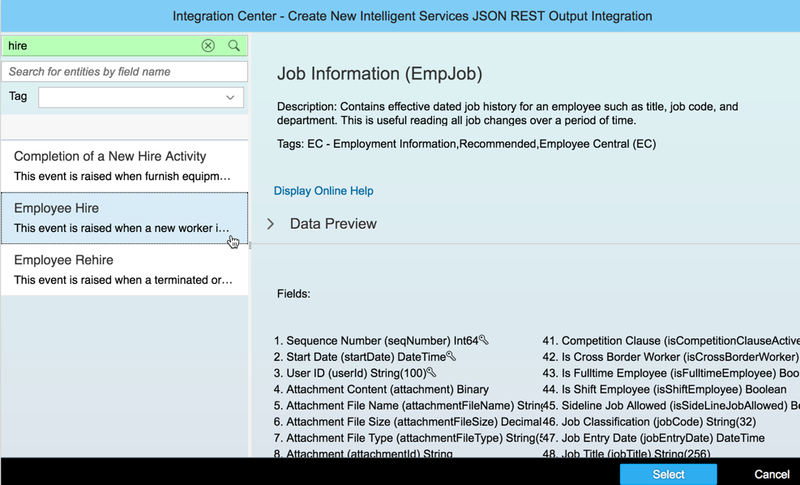 The Personal & Job information shown on the page is the information that is available as the workflow context and is provided by the SuccessFactors Integration Center. 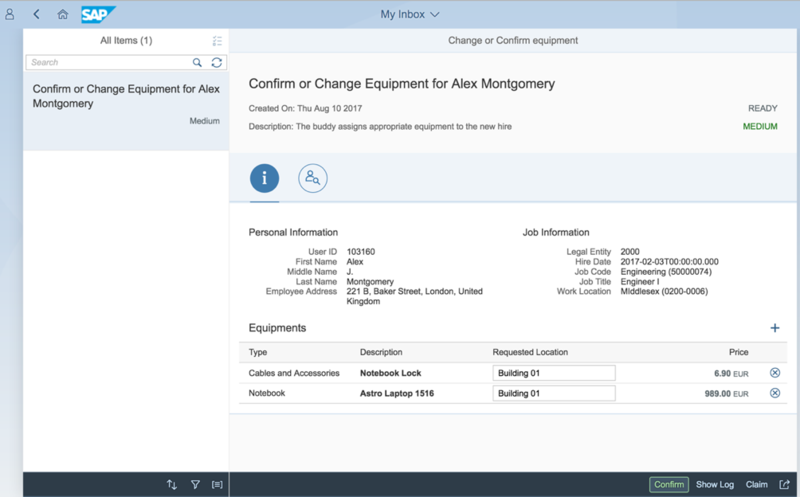 Once the buddy confirms the equipment based on the need and availability, a task is created for the hiring manager and available in the SAP Cloud Platform’s My Inbox application. The manager decides to approve or reject the task. 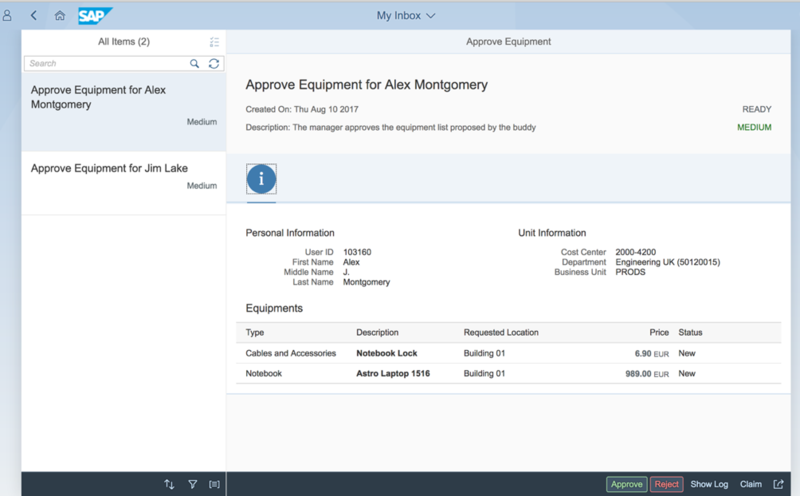 If the manager decides to approve, then a shopping cart for the requested equipment is created in the S/4HANA system. The shopping process continues as it is defined in S/4HANA, and once the equipment is delivered, the buddy will get a task to confirm the same. With the use of Intelligent Services, Integration Center & SAP Cloud Platform Workflow we were able to easily extend the standard Onboarding process in SuccessFactors. There are a lot of pre-delivered events as part of Intelligent Services spanning across multiple modules like Employee Central, Recruiting, Onboarding, Operational Workforce Planning, Compensation Management, Talent Management, etc. So, not just the new hire Onboarding process but a lot of other processes in SuccessFactors can be extended to meet the growing business need with the solution landscape detailed in this blog.